Food Costs > How Much Do Grapes Cost? How Much Do Grapes Cost? 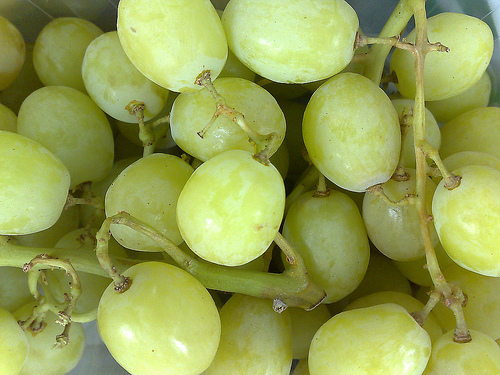 Crunchy, sweet and packed with juice, grapes are able to satisfy our cravings in a very healthy way. Grapes can either be consumed on its own or can be blended into a smoothie for a flavor anyone is sure to enjoy. On average, a pound of grapes can cost between $1 and $4 at your local grocery store such as Walmart. The costs will really depend on the time of the year, the color, if it’s organic and where it’s purchased from. Aside from the popular seedless green and red varieties, another popular variety exists — the cotton candy grape. These grapes taste just like cotton candy and can range anywhere from $4 to $9 per pound, depending on the season. At a local wholesale club, such as Sam’s Club or Costco, they will often sell its grapes in a three-pound plastic container, which can retail for about the same price range mentioned prior. Statista, the statistics portal, allows you to track the costs of seedless grapes since 1995. In 1995, the average cost per pound was $1.86. Today, in 2017, the average cost is $2.88 per pound. The price of grapes per pound, according to the USDA as of 2013 was $2.09 per pound or $0.72 per cup. Concord grapes, a popular grape used for winemaking, will greatly depend on how you’re going to purchase them and where you live. If you were to pick them at a local farm, then you could pay anywhere between $0.20 to $1.50 per pound, while buying them directly can cost $1 to $3 per pound online. The more you purchase at once, however, the lower this price will be. Grapes are commonly packed in plastic bags and are priced by the pound at most local grocery stores. Grapes will be available year round. Most local grocery stores only carry red and green grapes, each with its own distinct flavor, but other colors do exist such as blue, purple and even black. While a majority have no seeds, some do. Generally, the grapes with seeds are much larger than seedless grapes. The average serving size will be one cup or about 30 grapes. One cup of red or green grapes will have 04 calories, 1.09 grams of protein, 1.4 grams of fiber, 4.8 milligrams of vitamin C, 10 micrograms of vitamin A, 0.24 grams of fat, 288 milligrams of potassium, 0.54 milligrams of iron and 3 micrograms of folate. Grapes also have a high water content, are high in antioxidants, and red grapes, in particular, contain phytochemical resveratrol. Grapes are known to help with constipation, kidney disorders, preventing cataracts and even fatigue, according to OrganicFacts.net. Medical News Today offers nine ways grapes can help, including fighting off cancer, preventing heart disease, controlling high blood pressure, minimizes constipation, helps with allergies and can even control acne. There are three main types of grapes grown in the world, namely the European Vitis vinifera, the North American Vitis labrusca and Vitis rotundifolia, and the French hybrids. Most of the wine and table grape varieties are from the European species, Vitis vinifera. The resveratrol in grapes significantly reduces the risk of strokes by changing the molecular mechanisms in the blood vessels. The Environmental Working Group recommends buying the organic version since grapes fall on their dirty dozen list of the fruits with the highest pesticide exposure. Grapes will always be best stored in the refrigerator and should always be washed before being consumed. If possible, buy from the local farmers markets because the prices will be much lower and the fruit will be at its freshest. Do not forget to look out for sales. Most grocery stores will hold sales every week on their fruits, including grapes. Anything less than $2 per pound is deemed a good deal. 3.50 PER LB! Too much. Ten dollars for 2.5 lbs of grapes! I was not paying attention to the label. I thought it said 3.50 for the entire pouch. I was very surprised after being rung up. Bet I won’t let a single one of these grapes go to waste.